Bravo’s Andy Cohen is feeling the heat on social media after Sunday night’s episode of Watch What Happens Live. 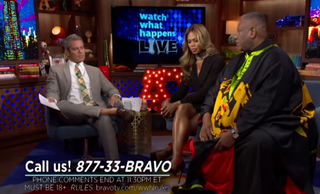 Cohen, whose guests included Orange Is the New Black star Laverne Cox and Vogue Editor-at-Large Andre Leon Talley, felt it was appropriate to give Amandla Stenberg the label “Jackhole of the Day” after the Hunger Games star called out Kylie Jenner for appropriating black culture, specifically cornrows. “Today’s Jackhole goes to the Instagram feud between Kylie Jenner and Hunger Games star/Jaden Smith’s prom date Amandla Stenberg, who criticized Kylie for her cornrows, calling it cultural appropriation. White girls in cornrows … is it OK or nay, Laverne and Andre?” Cohen asked. And you know what? I’m not shocked by anything Cohen says on that show anymore. His sole purpose is to wear shoes without socks, and a—holes are gonna be a—holes, as he’s proved numerous times before. So it’s nothing new. Do I expect him to understand why Amandla called out Kylie? Absolutely not. “To me, it’s fine,” Talley replied while wearing his Sunday-best caftan. “Umm … Bo Derek,” Cox responded. It seems as though a 16-year-old has more common sense than Cox, Talley and Cohen. Cohen’s comments, as well as Cox’s and Talley’s agreeing with them, did not sit well with those on Twitter. The hashtag #boycottbravo was started in support of Amandla. As much as I appreciate Cox’s work for transgender women’s rights, for her to sit there and not speak up for a young girl is appalling. And to cite Derek? Yes, if Cox knew anything about Bo Derek and her cornrows, she would realize that when Derek wore those cornrows, she made it the “in” thing, even though black women had been wearing them for decades. The true “Jackholes of the Day” were Cohen, Talley and Cox.